Today I knew the temperature would be the hottest it had been so far this year and I wanted to get up early and try to do some top water fishing! One of my favorite lakes for top water if Summit, I like it because it has a lot vegetation and a variety of different shorelines to fish. I got up really early to beat the heat. I was at the lake and just getting on the water around sunrise so I was able to get some good pictures! The lake was very similar to the last time I fished it in that around the shore there was about 3-5 ft of clear water before the weeds started. 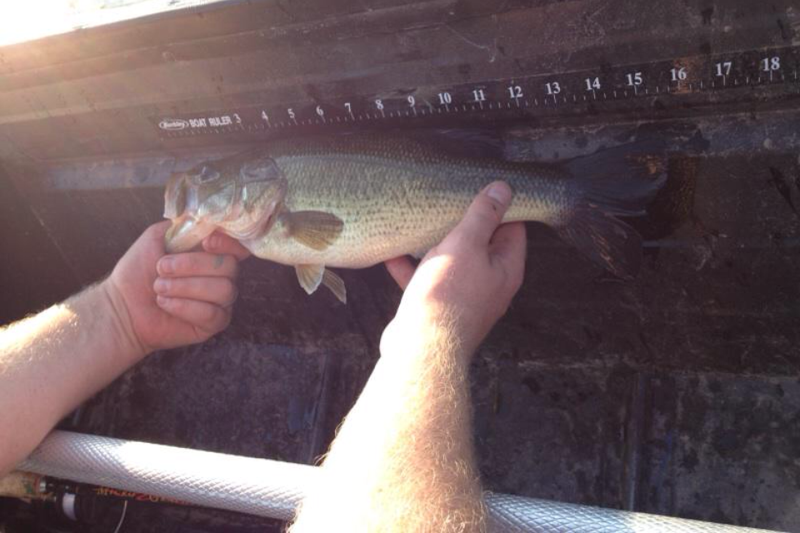 So I started around the piers and threw a top water frog and immediately started catching nice 15-16″ bass. I fished two or three of the piers until the bite slowed a little bit. Once it slowed down I switched to a plastic worm and threw to the same spots and started catching them again! It was a fast and fun morning, I only fished for a couple of hours before the temperature for into the high 80’s and I packed up. I caught around 15 fish and all were between 12-16 inches! 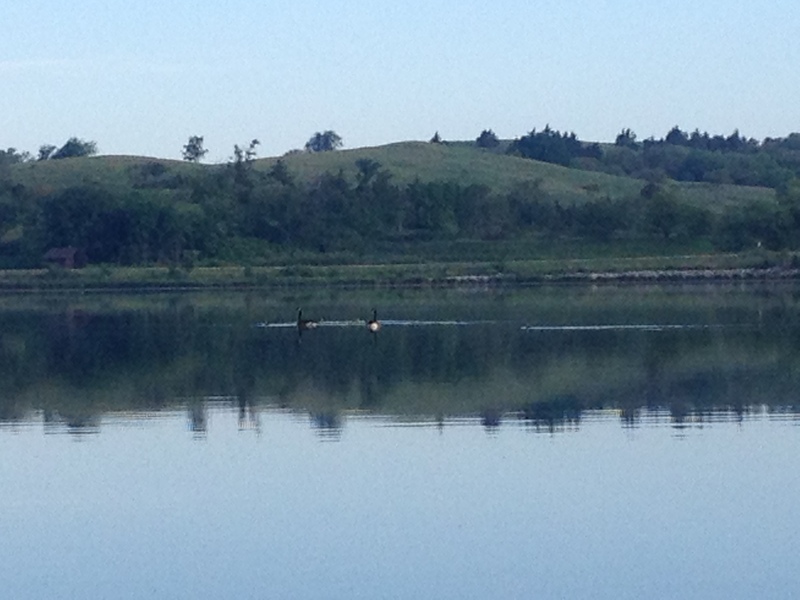 This lake has a lot of quality fish and is very well maintained! I would definitely recommend especially you plan on camping. This weekend I decided I wanted to camp. We have camped out at Summit before and since she liked it out there we went back. After setting up the tent we got about an hour of fishing in before dark. The weather was great! We had a good fire and grilled hot dogs. Around 4am a big storm rolled through which rocked our little tent but everything stayed dry. The next morning it rained pretty heavily until around 10am. Once the rain cleared we got back out on the lake. If you are familiar with Summit you know that there is a ton of vegetation in the lake so our lure selection had to be adjusted accordingly. I spent most of my time throwing a lipless crankbait (or rattle trap) and a texas rigged creature bait. I caught plenty of fish, all were away from shore in about 8ft of water right off of the weed lines. People fishing the bank or from shore were having trouble finding them but anyone fishing the suspended fish off of the deeper weed lines was catching fish. Below are some good pictures, kinda cool getting them coming out of the water. I really enjoy going to Summit and always seem to catch nice fish! Great boat ramp, camping, swimming and hiking. Caught a lot of fish and of different species. 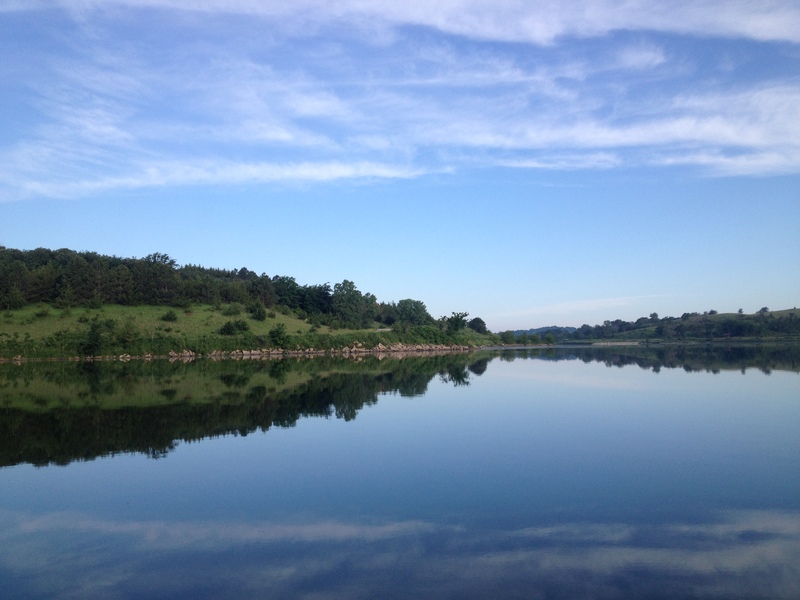 The lake has great water clarity and structure and is a short distance from the metro area. 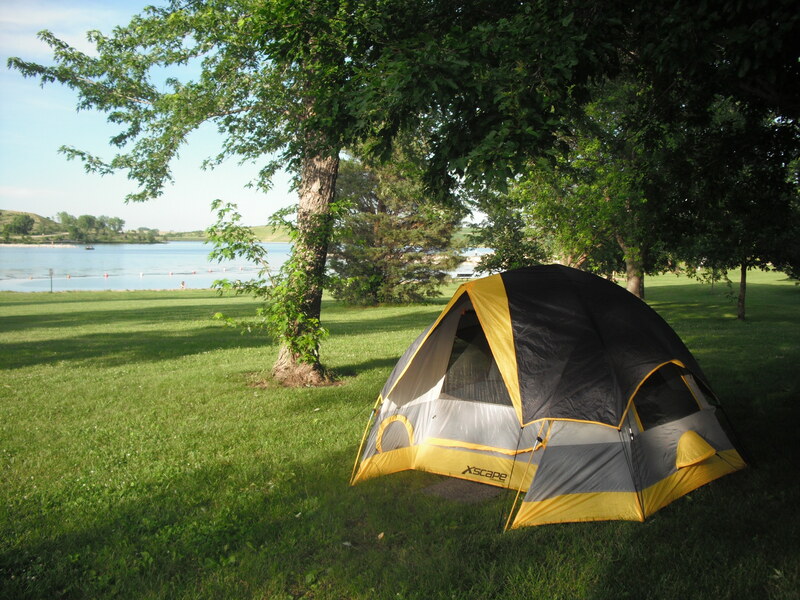 I had decided this week I would like to go camping rather than just spend a few hours on the lake. I had been told about this lake from my Dad who had taken our family camping here when I was really young. The lake seems to be very popular as there were a lot of other campers this weekend. It is also a short 30-40 minutes straight north of Omaha so it is a pretty easy drive. 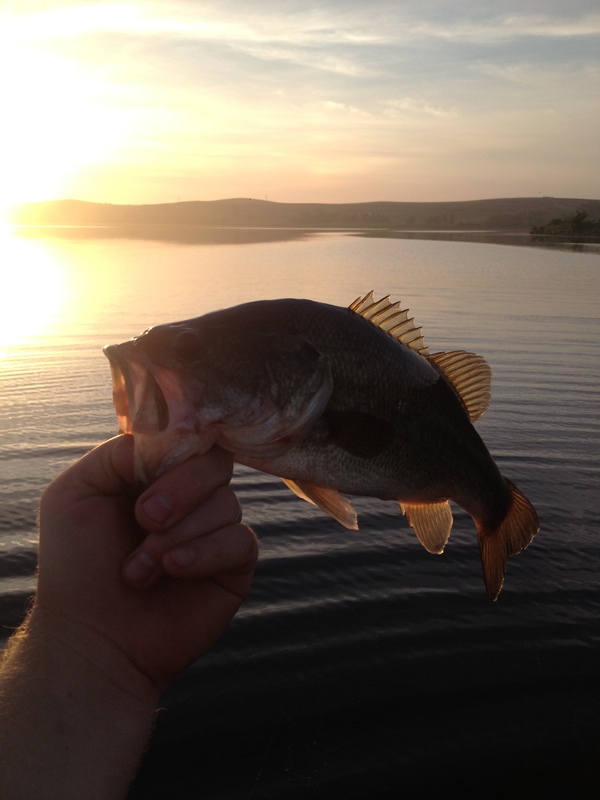 After doing a little research on the lake I found there are good populations of Bass, Walleye, Crappie and Sunfish. I mainly target bass but if I can get into catching some good Walleye or Crappie that’s always fun. 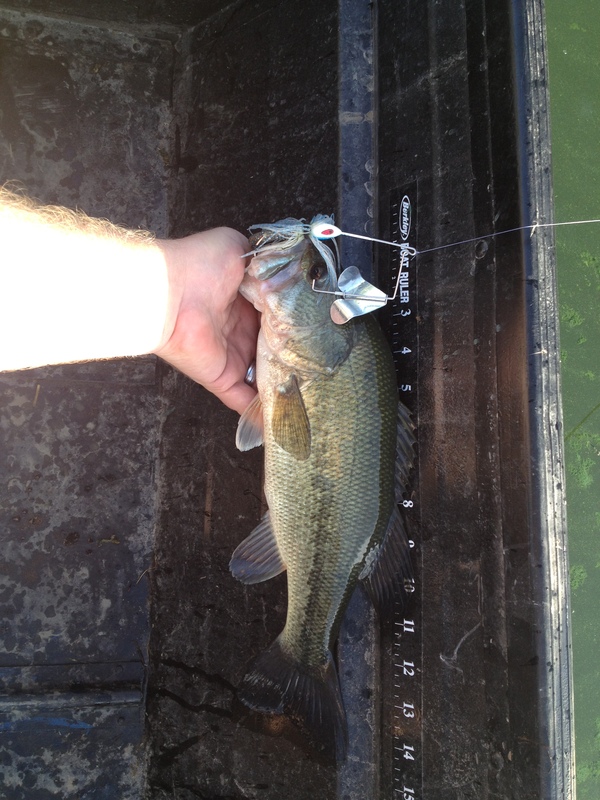 I also read a few reviews regarding the lake on the NEFGA forum, and people were saying the weeds in the lake were pretty bad, so I prepared by putting on heavier test line on a few rods and pulling out some topwater frogs. 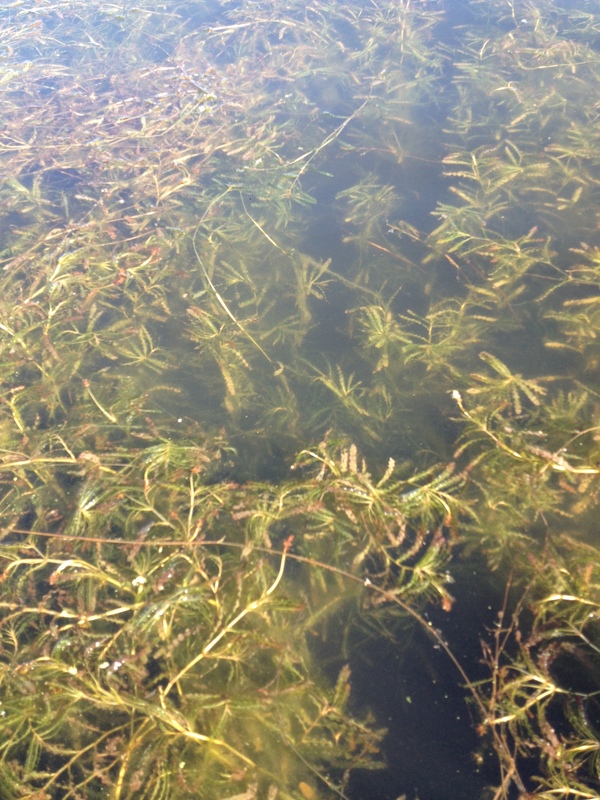 Once I got to the lake Friday I found the weeds to be just as thick as I had been told and it covered any part of the lake that was about 7ft deep or less. I included a few pictures below showing the vegetation. I started my approach by throwing a topwater frog and a chartreuse spinner bait into the weeds and pulling them through. Neither of the lures seemed to produce any results, although there were a lot of schools of baitfish in the weeds and a lot of frogs sitting on the pads. After a little while I switched up to fishing the edge of the weed line by the deeper water. 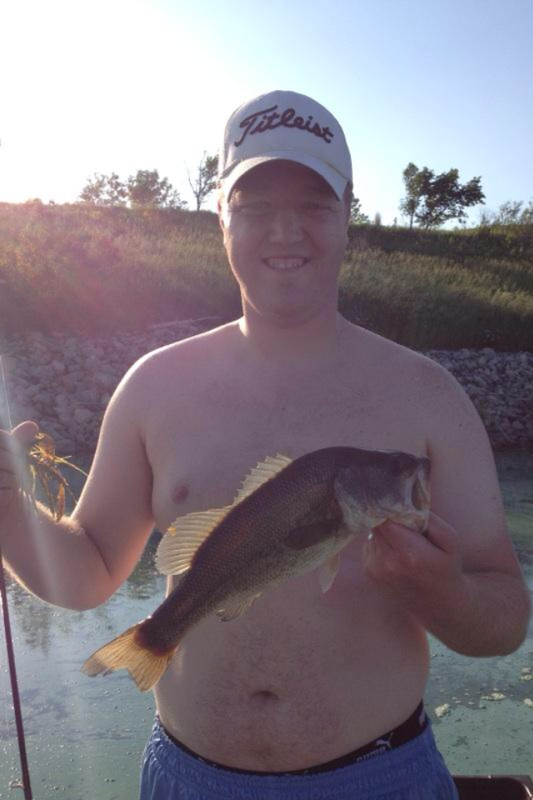 Here I threw the spinnerbait and also threw a new Rapala rattle trap I had picked up this winter. But again I didn’t have a single bite. 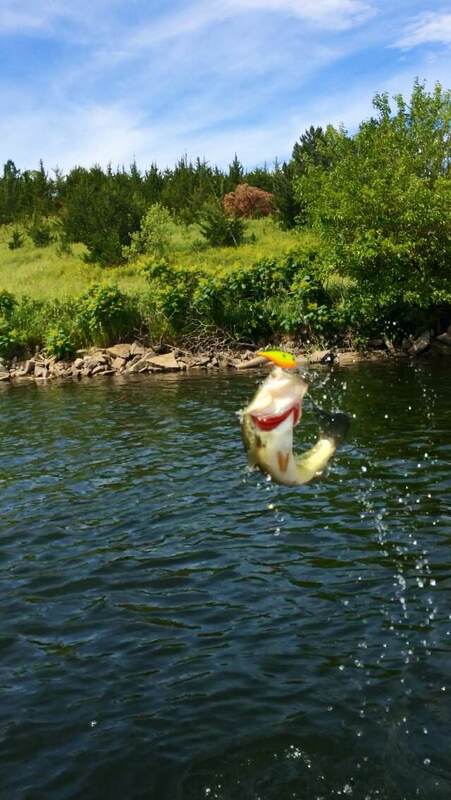 So being that I was in a small flat bottom boat I decide to oar myself into the middle of the weed patch and began flipping a ¼ oz green pig and jig into the small open pockets of water deep in the weeds. Instantly I started catching fish, and this pattern continued for the rest of the evening. 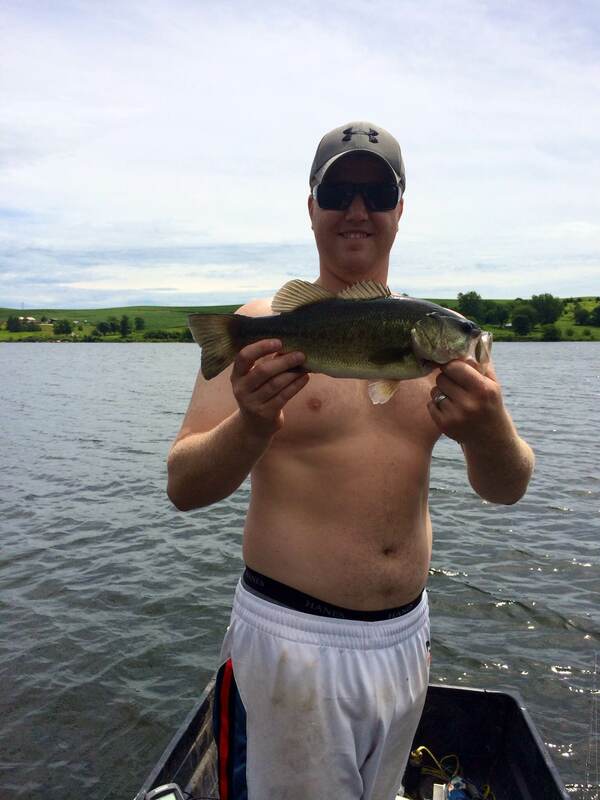 The fish in this lake were healthy and most of them were right around 13-15 inches. 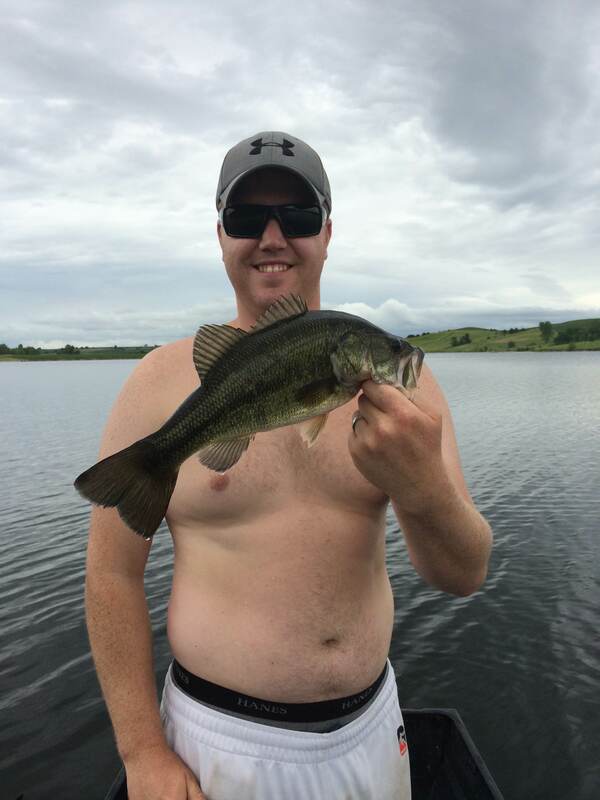 I caught one or two at 16-17 inches but I believe the length limit for bass here is the normal state regulation of 15 inches rather than the 21 inch limit a lot of other lakes close by put on their fish. The next morning I rose around 6am just as the sun was starting to come up. 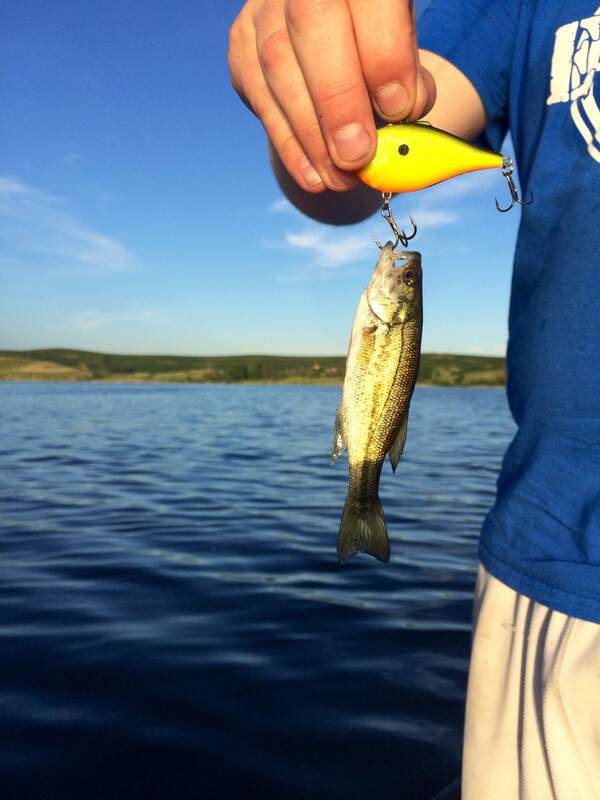 Since it is getting into the heat of summer and I knew the morning bass would be active I tried throwing a buzz bait to see if I could get them to come up for a bite. I had also notice the night before that around the edge of the lakes shore line there was about 6-8 feet of clear water before the weeds started and had hooked a few fish there. I figured these would be hotspots as the morning fish tried to catch frogs and other animals and insects at the waters edge. And that guess was spot on! I started catching a lot of nice bass and all them were striking the buzzbait within that open water gap. The bite never slowed down all morning although the approach did slightly. After the morning went on a little bit I switched from the buzzbait to a similar colored spinnerbait and the bites continued. This was a fun lake with plenty of nice fish. The campgrounds were great and had plenty of fun things to do, such as trails, horseshoes, playground, beach etc… this is definitely a place I will be visiting again. Below are some of the pictures for you. This lake is a lot of fun to go to. 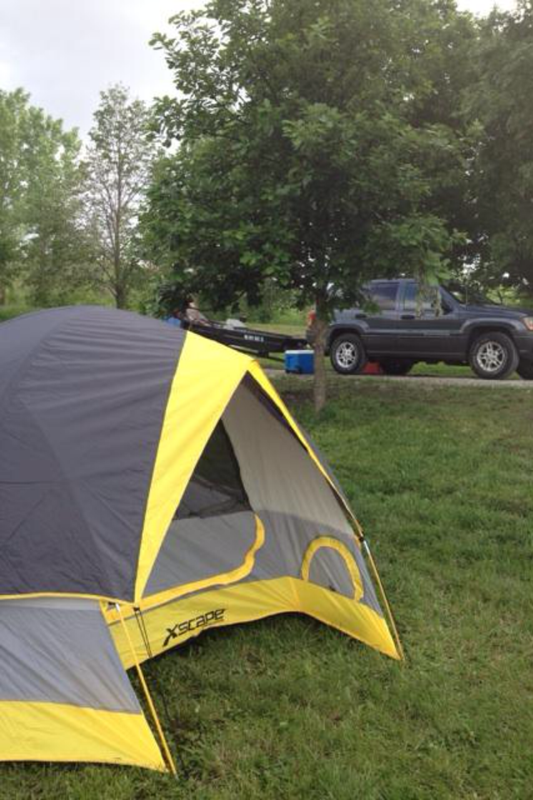 Good camping and park areas, with a good boat ramp and dock. 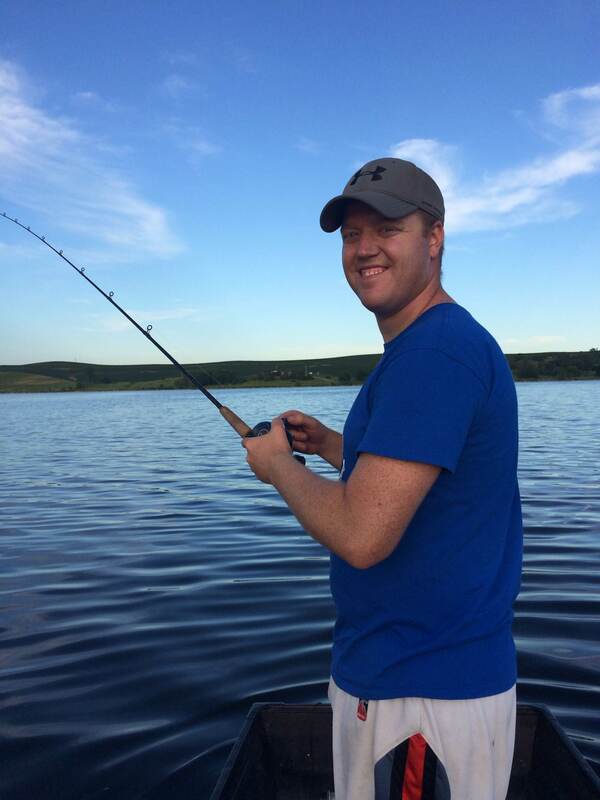 The fishing is great and has a lot of different kinds of fish that are easy to find with a boat.